HomeAnnouncementsIssue 2 has been released! 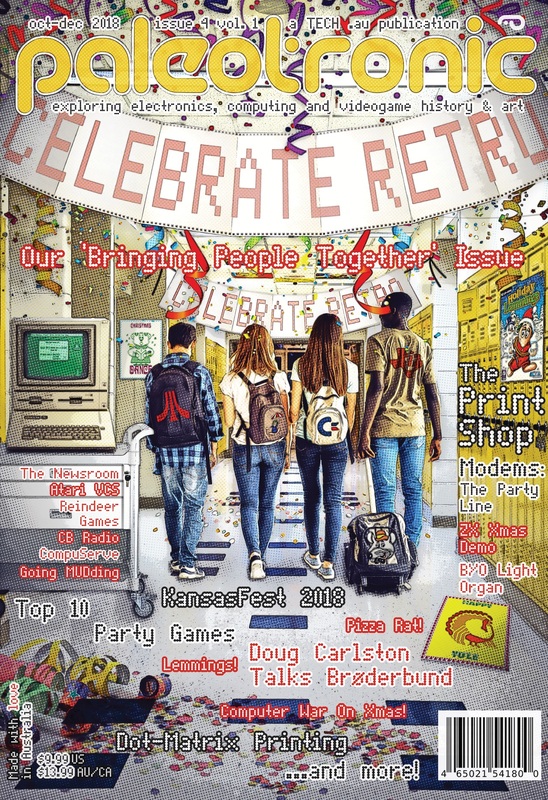 Issue 2 has been released! 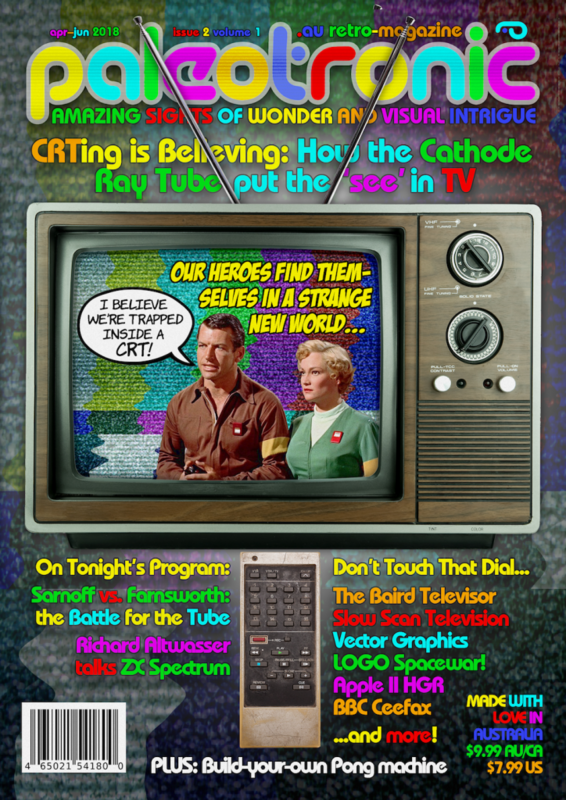 Our second issue delves into all things CRT, exploring the history of the cathode-ray tube, the birth of television, early computer and video-game graphics and so much more. The digital edition weighs in at a hefty 150 pages! FEATURE PRESENTATION - “Picture Perfect”: A farm boy from Idaho faces off with the King of Radio in the race for television. GADGET GRAVEYARD - But before Farnsworth and Sarnoff, Scotsman John Logie Baird explored another way to TV, a mechanical one. RADIO WAVES - Getting television signals from here to there. POPPED CULTURE - Early science-fiction TV programs – and Tron. ENTERTAINMENT CENTRE - Lounge room TVs through the years. CRYSTAL BALL - Visions of TV’s future from the past. ARCADE RATS - Spacewar: From the Laboratory to the Arcade. ANCIENT TONGUES - Have a blast playing 2-player Logo Spacewar! LOADING READY RUN - The ingenious and quirky ZX Spectrum. DIAL-UP CHAT - An interview with the legendary Richard Altwasser. PIXEL PLAYAS - No Software Required: Computer Space and Pong. THE BARD’S INN - Ultima! Early graphical role-playing games. NO CARRIER - BBC Ceefax: the first Teletext information service. CHIP TO BE SQUARE - The Noise Channel: The AY-3-8910. POINT AND CLICK - Welcome to Macintosh: Enter the GUI. WOMEN IN TECH - Rosie the Riveter becomes Tracy the TV assembler. GEEK UNDERGROUND - PayTV Scrambling: Captain Midnight vs. HBO. THE ART SCENE – Prolific Teletext artist Horsenburger talks textart. THE TOY STORE - Shooting the TV: Not like Elvis, but with light guns. THE ARCHIVIST - Erasing the Tapes: Lost television episodes. COLLECTOR’S CORNER - Danger WIll Robinson: Beware the CRT! EMULATION STATION - Emulating the Tube: Raster on the LCD. HAMATEUR HOUR - Slow Scan TV: Super long-range television. HEAVY DUTY - Electronics at War: “C”-ing radar with the CRT. ELECTRONS IN MOTION - Cathode-ray tube flight displays. THE BUSINESS - Who’s Going to Pay? Television advertising. THE PRO SHOP - The Cardioscope: Watching the Heart. THE BREADBOARD - Pong: or How I Learned to Love Getting Paddled. ANDROID DREAMS - The Murder on Channel 4. THE DEAD LETTER OFFICE – Computers on the TV. FIDOMAIL - An early Apple II advertisement spawns commentary. INTERESTING DEVELOPMENTS - OpenEmulator and Applesauce. MICROM8 UPDATE – The latest features added to our emulator. YESTERDAY’S NEWS - The Oregon Trail handheld game and more. RETRO REVIEWS - C64 accessories: uCassette, SD2IEC, 4-player. ON THE ROAD - Visiting the Australian Pinball Museum. ATTACK OF THE CLONES - FEO HAO Retro Game HD Genesis Clone. BACK IN THE DAY – 1977: The first West Coast Computer Faire. THANK YOU - Special thanks to all of our generous supporters. COMMUNITY CALENDAR - Updates and upcoming events. THE BBS LIST - Internet Resources: Chat rooms, Facebook etc. THE FUN ZONE - CRT Crossword, Word Search and Comics! Want this issue? Subscribe now!